* 2012 Update: For the six-year anniversary of this program, we note that Bob's prediction was vindicated, that evolutionists would avoid this discovery and although so many peer-reviewed studies confirming soft tissue in many dinosaurs have been published since then, in 2012 it still seems that 99% of the public is ignorant of this, perhaps the greatest paleontology discovery in history. Further, on this topic (just like with short-lived Carbon 14 in diamonds and dinosaur bones), many evolutionists are science deniers and doubters. Also, of those who have learned about this discovery, thousands have been educated by our RSR DinosaurSoftTissue.com page which ranks highly on Google searches! * 2013 Update: Seven years after this program T. rex DNA has been found and our Real Science Radio webpage dinosaursofttissue.com has become the world's most popular (Google: dinosaur soft tissue) and complete listing of peer-reviewed papers confirming the existence of original dinosaur and dinosaur-layer soft tissue! Journals including Nature, Science, PNAS, PLoS One, Proceedings of the Royal Society, and the Journal of Vertebrate Paleontology, have published many papers (see that RSR webpage for links and excerpts) confirming biological material and even soft tissue in hadrosaur, titanosaur, [ostrich-like] ornithomimosaur, mosasaur, triceratops, Lufengosaurus, T. rex, and Archaeopteryx, etc. 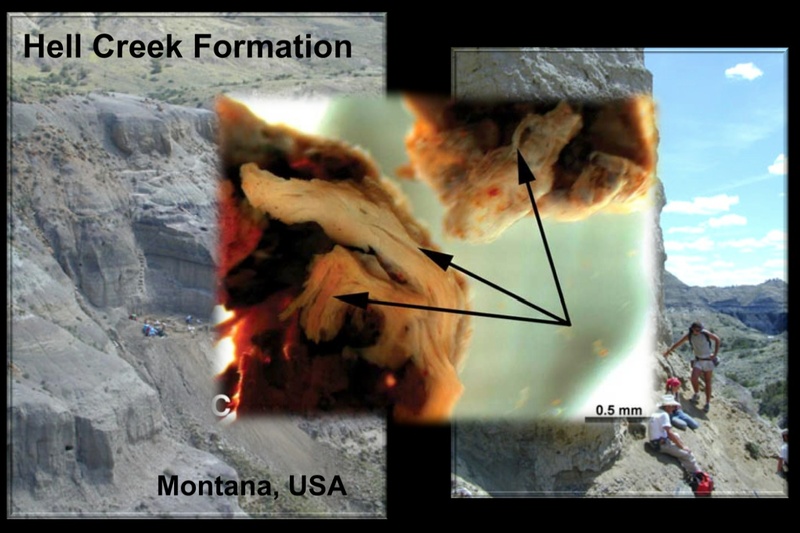 * "65-million" Year Old T. rex Soft Tissue: [This description includes updates from our RSR List of Not So Old Things!] North Carolina State University discovered original biological tissue from a supposedly65-million-year-oldd Tyrannosaurus Rex thighbone, with transparent and pliable blood vessels containing red blood cells! See photos here and at MS-NBC, the original 2007 Nat'l Geographic report, 2009 Nat'l Geo. confirmation, and the Hell Creek Formation excavation site worked by famed paleontologist Jack Horner of Montana State University. In 2011 ten leading universities and institutes including Harvard, the University of Manchester, and the University of Pennsylvania have verified that presumed dinosaur material is indeed original biological material from a dinosaur! Combined with the research on Egyptian mummies that established 10,000 years as an upper limit for how long such biological molecules could survive, this is another reason why creationists refer to dinosaurs as missionary lizards. Interestingly, PZ Myers just recently mocked RSF and repeated the now widely-discredited evolutionist hope that the "soft-tissue" dinosaur finds were "biofilm" contamination from bacteria. But as Bob Enyart summed it up, "This is dinosaur." * 2007 UPDATE: From New Scientist: "[Harvard's John] Asara nailed the case when he purified Schweitzer's samples and ran them through an ion-trap mass spectrometer... he was able to reconstruct the amino acid sequences of seven collagen fragments. Collagen evolves very slowly, and all the fragment sequences matched those of living species, including chickens, newts, and frogs." * Speaking of Palmer: Over at rsr.org/firmament, we embed and respond to Brett's 40-minute rebuttal video. Here's an example of its sloppiness. To criticize the scientific claims of Walt Brown's Hydroplate Theory, Palmer includes a 10-minute video by an east coast atheist who calls herself WildwoodClaire1, which contains vulgarity and has the sloppiness of an off-the-cuff rant. Claire claims, for example that Dr. Brown ignores matters that in actuality he (and the entire creation movement) pay great attention to. In mocking style, the host says that Dr. Brown doesn't take limestone deposits into account, even though his online and hardback book, In the Beginning, has an entire chapter titled, The Origin of Limestone that is even listed on his homepage. Brett then embedded her sloppiness into his own video. Similarly, Palmer confidently delivers his videos What the Bible Got Wrong: A Flat Earth, Part I & II. If the Bible (or even Augustine or Aquinas for that matter) taught a flat earth, you'd expect to find entire Protestant denominations and Catholic orders (like Benedictines, Jesuits, Dominicans, Franciscans) through the centuries teaching a flat earth. None have. You'd expect thousands of Christian leaders to be quoting such sources. No such body of literature exists. Perhaps Brett Palmer too believes the lie, the modern fabrication promoted endlessly by those who oppose Christ, that the church held to a flat earth. Aside from the president of the actual Flat Earth Society being an evolutionist, like Palmer, a leading secular historian has thoroughly documented the recently invented myth that medieval Europe, or the church, taught that the earth was flat. * UC History Prof. Debunks Myth of the Flat Earth: Dr. Jeffrey Russell, Professor of History at the University of California, Santa Barbara, has also taught history and religious studies at Berkeley, Harvard, and Notre Dame. His book, Inventing the Flat Earth, documents that 19th-century anti-Christians invented and spread the falsehood that educated people in the Middle Ages believed that the earth was flat. RSR notes that the anti-Christians spreading this fabrication allegedly includes some of Darwin's promoters like David White, and that those "educated people", the targets of this falsehood, would of course include bishops, monks, and ecclesiastical scholars. Prejudice and myth die hard, and a small army of professional historians have been unable to correct this evolutionist libel against Christians. 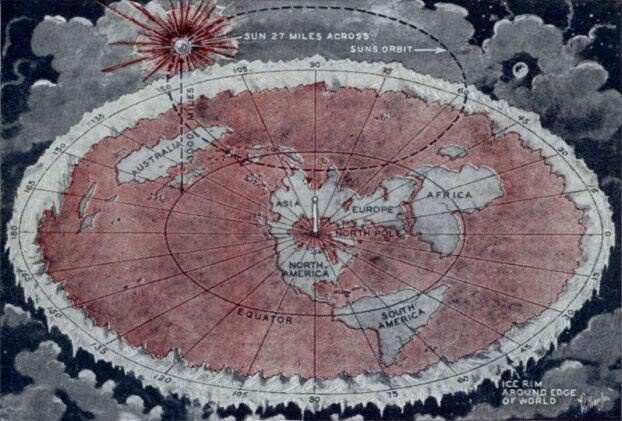 Toward that end however, see Dr. Russell's brief article, The Myth of the Flat Earth. Russell there mentions the widespread false belief that in 1491 Christopher Columbus faced inquisitors and theologians who held that the Earth was flat, which mini-myth has been widely debunked and identified as a pure invention of the author Washington Irving. * Flat Earth Society President Believes in Darwinism: As reported by LiveScience and in Creation magazine's Fall 2011 issue, the Flat Earth Society's president Daniel Shenton not only believes that the earth is flat, but he also believes in Darwinian evolution. Ha! The irony of course is that evolutionists mock creationists by asking if we believe in a flat earth, whereas the Flat Earth Society itself aligns itself not with creationists but with evolutionists.